Shure products are generally well packaged and the SRH-440 monitor headphones are no exception. The box is big and provides good protection during transit. Not to much here which is no real surprise it comes with a stereo jack adapter and nice coiled cable which is of great quality as is the twist in connector that is found at the side of the left phone. Also included is a Shure branded leather style carrying pouch which is a nice addition although it doesn't really provide much in the way of protection to your headphones on the go. Personally I love the design of the Shure SRH-440's they are not designed in any way to be fashion headphones. Rather the 440's are designed for their purpose and that is as a studio or home monitor. There is nothing to flashy about them, more so they are quite utilitarian in the looks department but one thing you do notice right away is they look classy. Build quality, as is again common with Shure, is excellent. The headphones are mainly constructed from plastic but it is of very high quality. Overall the headphones have a very sturdy feel to them and you get the impression they can take years of daily abuse just as a studio monitor should. The earpads are pleather which do tend to get a touch hot over time but they can easily be replaced by the Shure SRH-840 pads which are of thicker padding and nicer quality at a reasonable price. The headband is also pleather and could do with a touch more padding but on a whole nothing to worry about. Since cable is usually the first part to wear out on audio gear it is very nice that Shure has included a detachable system (and a very good one at that, clicking into place and locking) so upgrading and replacing worn down parts is possible with this headphone. Closed back design and the circum-aural fit paired with the thickness of the housing all lend themselves to isolating well and blocking out most ambient noise. We would easily reccomend these headphones for use in commuting or office environments. Sound on the SRH-440 is very balanced and neutral if a little boring. It feels almost cold. However one should remember here that the SRH-440 is designed primarily as a monitor headphone and these are traits that are preferred in music production with no one sound spectrum dominating the other. Bass does not have heaps of quantity but is rich in quality it does not seem slow the way many of its competitors do and while, as mentioned, it doesn't slam as hard as you will find on more fashion orientated phones it still reaches satisfying levels for audio purists. Mids are Shures bread and butter and well associated with what is know as "Shures House Sound". The SRH-440's are certainly in keeping with this tradition. Everything sounds good and correct but again doesn't really wow you if you are just a casual listener. It is sometimes hard to forget that Shure headphones are tools first and toys second. They take whatever sound is put in and throw it right back out without trying to alter it. Highs on the 440 are most likely the weak spot for me as they don't have the same level of sparkle that I am used to on some of my other headphones such as the Brainwavz HM5 studio monitors. Again they are good just not inspiring and are slightly lagging behind the mids and bass. Separation on the Shure headphones is excellent and is one of the real strengths of the SRH-440. Positioning and clarity are excellent and again in a monitor they should be. Soundstage is middle of the pack, probably down to the closed back design you will never get anything too huge in this category. Pratt is not brilliant and neither is timbre. Overall sound is very good for the purpose of a monitor but if you want something a bit more fun, engaging or intimate you had best look elsewhere. I know it may seem that i am a little down on the Shure SRH-440 headphones when it comes to sound quality, this couldn't be further from the truth. Sound quality is excellent its just that to me it is excellent in what i would want in a studio monitor headphone as opposed to a highly engaging listening device. In day to day use as my sole recreational daily driver I could see myself easily demanding more from the Shure headphone when i just want to enjoy my tunes. At times I think people tend to forget that the Shure SRH-440 are a tool primarily used in audio production and not in everyday listening. I think anyone who buys these phones for the right reasons would be extremely happy with them. 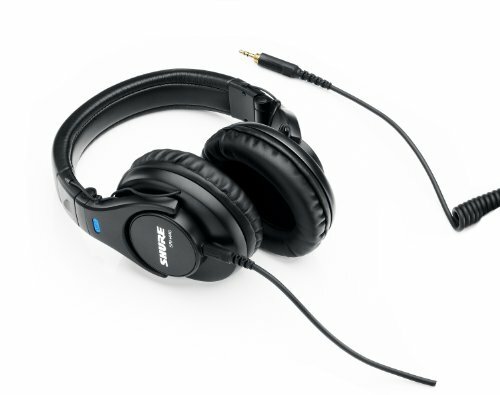 Build quality and comfort are excellent and this is backed up by clean and accurate sound. Thumbs up. To find out more about the Shure SRH-440 and the entire headphone range the Shure Website.